Here's to the new gym-na-sium. Athletics may not come first to mind when Vassar is mentioned, but it has been well served in the history of the college's buildings. The Calisthenium had been the first of its kind in 1867, exemplifying the founder's ideal of "a sound mind in a sound body" and inculcating the emerging techniques of calisthenics, or "beautiful strength," in the college's earliest students. By 1883, however, to the chagrin of the alumnae, the facility was falling behind those at the newly opened sister colleges, Smith and Wellesley. At the urging of Achsah Ely, a professor of mathematics and graduate of the Class of 1868, the Boston alumnae, with the leadership of Florence Cushing, and the New York club had raised $20,000 by 1887 for a new gymnasium. By early 1889 a trustee/alumnae committee had selected a site to the north and east of Main. President James Monroe Taylor observed that the site—close enough for the power plant to heat it, located where "the view from the Observatory should not be trespassed upon," near, but not too near, to Main—could be reached conveniently but was "yet so far away that carelessness as to warmth of clothing would not be encouraged." 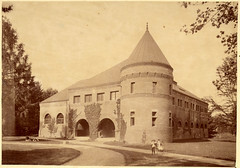 The original plans for the new building by the prominent Brooklyn architect, William Tubby, who had recently completed the Pratt Gymnasium at Amherst, proved too costly, and the resulting compromise, a turreted Romanesque Revival building, substituted brick and terra cotta for Tubby's original grey stone. 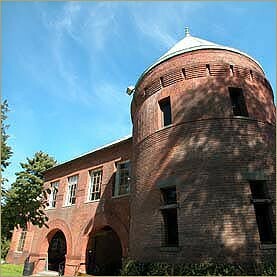 A contractor for the revised design was selected, Mr. Otis of Kingston, and construction began on March 26, 1889. Virtually complete by the following October, the building was presented to the college from the alumnae in June, 1890. 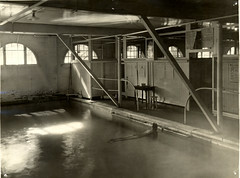 In addition to the change in materials, the Students' Association's requests for a swimming bath, a tennis court, a bowling alley, and space for calisthenics and supervised exercise had been scaled back and a visitors' gallery and a suspended running track also eliminated for budgetary reasons. Within two years, the extreme pressures of increased enrollment forced significant changes in the building's use, when the second story became an assembly room for day students and boarding students forced to live off campus in the Windsor Hotel. A generous 1905 addition to the rear of the Alumnae Gymnasium, designed by the architect William Downing, increased the building's athletic space, and allowed it to serve its original purpose until the opening of Vassar's third athletic building, Kenyon Hall, in 1933. At this time—although Swift Hall (1900) and Metcalf House (1915) principally served the medical needs of the college—doctors' offices and nurses' suites were installed in the nearby gymnasium, which was renamed, in honor of the leader of its original fund-raising, Ely Hall. In 1937, the geology department moved into Ely—where it remains, along with geography—and the first floor exercise room was converted, under the personal supervision of President MacCracken, into the Aula, it's name derived from the Latin term used for continental academic halls. The window openings were lowered to provide more conventional views out and in, the brick walls were painted white, and sound-dampening material was added so that the faculty, which had been meeting in Rockefeller Hall, could hold its deliberations in a more congenial setting. 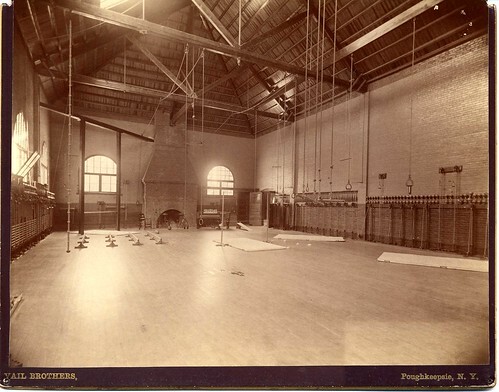 (2) In the mid-1970's, the Aula was given over to students for use as a gathering place, and 1994 the interior of the room was restored to its turn of the century appearance. Elizabeth Daniels has observed that the three annual "hall plays" that became a tradition years later were named after the theatrical productions that used to be performed in the old Alumnae Gymnasium hall. The windows on the south side of the building, where the swimming pool was located, retain their original dimensions. Daniels, Elizabeth. Main to Mudd and More. Poughkeepsie: Vassar College, 1996. 27-30. Van Lengen, Karen and Lisa Reilly. The Campus Guide: Vassar College. New York: Princeton Architectural Press, 2004. 108-10.